Hey everybuddy! I have a very special guest today. What's better than Chicken & Waffles? How about WAFFLES & Waffles! In honor of my recent road trip to Chicago, a very special friend and reader has named her new chicken... wait for it... WAFFLES! I have a CHICKEN named after ME! I have a CHICKEN named after me! You KNOW I want to be a chicken rancher when I grow up. So this is just the coolest. Don't tell the Boss though. She'd probably want a chicken named The Boss. I bet you're wondering how it is we have a friend living in the city of Chicago who has CHICKENS!!! Her name is Maribeth and I think I want to marry her. • Waffles is actually a Red Hen. She's a GIRL!!! • Chickens are legal in Chicago. • They lay 1 egg a day. • They don't need boys (roosters) because just like all females, the eggs are there no matter what! • Just like cats, chickens will eat mice. She didn't say if they like KFC. • They're favorite snack are meal worms. • They make a funny scratching movement when they're looking for bugs. Maribeth calls it the chicken dance. Click the video below to watch our Chicken Dance Dance-Off. Or click HERE to watch on YouTube. 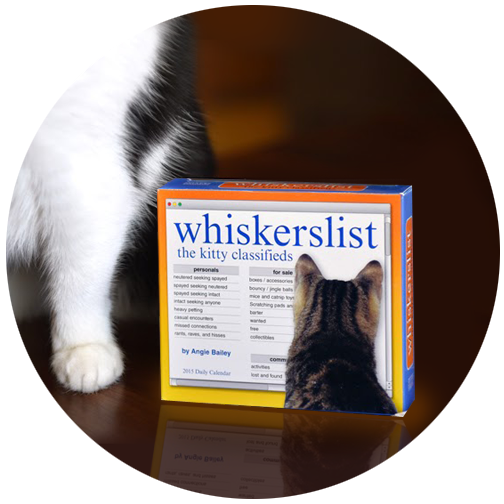 Whiskerslist - The Kitty Classifieds 2015 Calendar GIVEAWAY! Giggle everyday with this hilarious page-a-day calendar inspired by the book that combines two of the hottest things on the internet - craigslist and CATS. Talk about living the dream! Waffles....you don't want to know what chickens will eat. I have never seen them refuse anything. It's a bit disgusting. What a honor it must be to have a chickyum named after YOU! Way to go Waffles!! I hate to say it, Waffles (kitty and chickie), but that video made me hungry! I gotta agree wif Summer - dat video made me hungry! Wow!!! We bet Katie is soooooooooo jealous!!!!!! We want to know her response!!!! MOL!!!!! if people are naming chickens after you that means you have officially hit the big time!! OMG - that is the cutest video and chicken ever. We did not know chickens were legal in the city of Chicago. Guess they would make nice neighbors tho, they don't disturb the peace when one is sleeping.. Maybe Katie could have her own chicken too. errrr, maybe not. That is so awesome, Waffles! Except now, every time you want to eat a chicken, you have to think about your new friend, Waffles! What an honor! Maybe they'll name the next royal baby after you too. I think "Prince Waffles" sounds good. Waffles we have a feelng we like chicken more than you. What do you think about that? Ha! Adorable video! And Waffles! Congrats on having a chicken named after you!!! or a hen, I suppose BOL! Now that's pretty cool. My mom has had chickens for a number of years, and their eggs are so yummy. True story! MomFOD gets fresh eggs regularly from a family member who has chickens right here in the city!! It's such a cool way to feel like a farmer. One of the chickens is even MomFOD's. She named it "fragolina" or "little strawberry" in Italian. :) - Crepes. What moves! 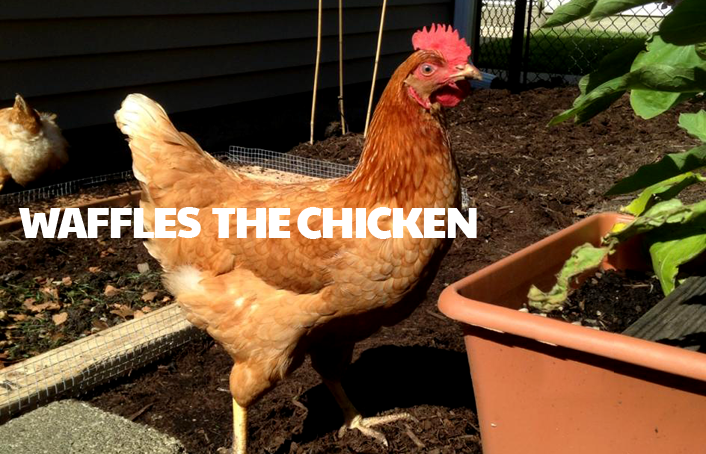 Waffles the Chicken is a great dancer and a very pretty chicken. 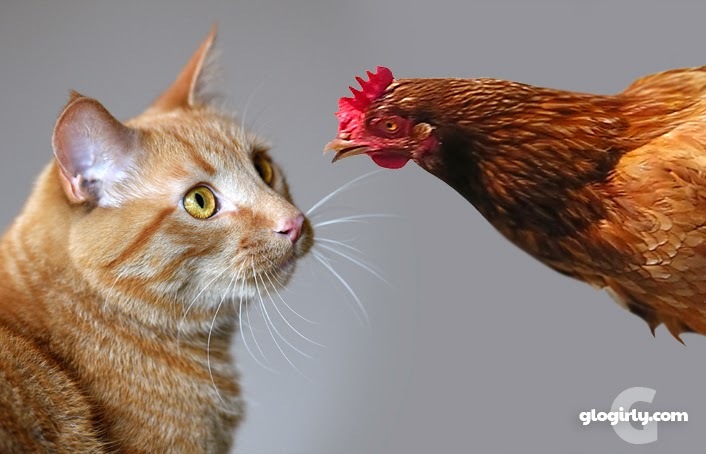 Did you notice Waffles that some of Waffles the Chicken's feathers are the same color as your furs..mol..and you are both good dancers! Waffles, you wouldn’t EAT your namesake, would you? If not, send her over here. I like chick-hen too. Cute dance. Like the cha-cha. OH yer killin me and mommy. LOVED that. What an honor to have a real live chicken named after you, Waffles! OMD, a chicken named in YOUR honor?!?! That's fangtastic! Totally worth dancing over. Will you still eat chicken? We have kangaroo sometimes. You have a girly chicken named after you? Waffles really does get all the ladies! Your music is different than the chick-hen dance mum does. But it works for us! OMC - Waffles the Chicken is soo cute! And you know what, it's kind of weird if you ask me but chickens will totally eat KFC. My old boss had lots of chickens and when we went out to Olive Garden for lunch she always wanted our leftovers for her chicken. Most of us were eating chicken alfredo... lol. We asked her about it and she said they ate chicken too. OMC! You have a chick-hen named after you! Our neighbours have got chick-hens. I wonder if they will call one Flynn if I ask them. Tail Therapy Gifts for Pet Lovers GIVEAWAY! Mad Kitty Happy Hour is Here!